If you're looking for a unique wedding ring style or love Native American jewelry, consider choosing turquoise wedding bands. A semi-precious stone with a vivid blue color, turquoise is a popular gem choice for many types of jewelry. In fact, artisans have been making turquoise rings for thousands of years. Many people associate this gem with Southwest-style jewelry, but turquoise is actually mined in several countries around the world. In addition to its eye-catching shade, turquoise has several other properties that make it unique. This gem is quite soft, much softer than a diamond or sapphire, which means it can be prone to scratches and fractures. Typically, the stone is opaque, and it often includes veining and flecks of other materials. 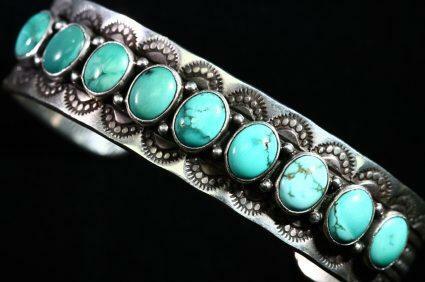 In many cultures, turquoise is associated with wisdom, protection, and healing. In most turquoise wedding rings, the gemstone is protected with a bezel setting or used as an inlay. It's often combined with sterling silver, white gold, titanium, or platinum, since these cool-toned metals complement the soft blue of the gem. Before you select a wedding band style, it's important to consider how the properties of turquoise and the ring setting will affect the durability of your band. Because turquoise is so soft and is prone to fracturing, it needs to be protected. You'll be wearing this ring for decades to come, so choose a style that shelters the gemstones. Bezel settings and inlays are the best choices. It's also important to ask the jeweler about any treatments to the gem. The color and hardness of turquoise can be variable, and lower quality stones are often treated to improve these characteristics. It's common for the stone to be stabilized, but ask the jeweler about how the treatment will hold up to years of wear. 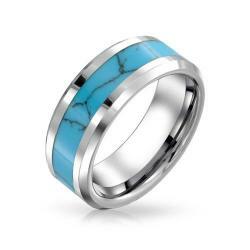 Turquoise bands make great wedding rings, and you'll have lots of shopping options. You local jewelry store may have some beautiful choices, especially if you live in the Southwest where turquoise jewelry is very popular. You can also check out antique stores and vintage jewelry shops, since turquoise has been a favorite wedding ring choice for decades. Also consider artisan-created rings from jewelers on Etsy.com. These designs are usually crafted by hand, resulting in high-quality wedding bands. If you can't seem to find a design that's right for you, have a ring custom created by a local jewelry artist. Remove your ring when using harsh cleansers or performing rough household tasks. Protect your turquoise band from exposure to chemicals, which can change its color. Don't use jewelry cleaning solutions on your turquoise ring. Instead, stick with simple soap and water. Wear you ring often, since the oils from your skin will help the stone stay hydrated. Although turquoise is a sensitive gemstone, the right ring design and the proper care will ensure your wedding band looks as beautiful on your golden anniversary as it does today.